The Screaming Jets proudly announce a national tour, ROCK RADIO RIOT, with rock contemporaries and special guests, Boom Crash Opera. These two Australian radio favourites team up to deliver a powerhouse of high rotation hits in what is sure to be one of the rock events of the year! Casper had a great chat with Dave Gleeson about what to expect. The tour commences in Sydney on August 3 and travels around Australia concluding on September 15, showcasing their body of rock songs and radio hits across the catalogues of both artists. 2017 was a huge year for The Screaming Jets with two solo laps of the country off the back of their “Chrome” album success, culminating in the They Who Rock tour with the Baby Animals. With 12 sold out shows across the country, punters proved that radio rock is still alive and proud in this country. The Screaming Jets radio history delivers a long line of high rotation hits to the airwaves. In 1980 radio station Triple M Sydney was launched and 11 years later, in 1991, The Screaming Jets released what was to become an Australian rock classic titled “Better”. Fast-forward to August 2017, Triple M Sydney crowned “Better” (penned by former member Grant Walmsley) as the most played single by an Australian artist in its 37 year history. “Better” has been played over 5000 times since it’s release 26 years ago! For over 25 years, The Screaming Jets have enjoyed high rotation for their songs on National Commercial Radio including: ‘Helping Hand’, ‘Shivers’, ‘Shine On’ ‘Stop The World’ ‘October Grey’ ‘Eve Of Destruction’, ‘Sad Song’, ‘Friend of Mine’ ‘Cash In Your Ticket’ & ‘Automatic Cowboy’. With a revitalized line up of Dave Gleeson (vocals/worldly opinions), Paul Woseen (bass), Jimi Hocking (guitar), Scott Kingman (guitar) and new drummer Mark McLeod pounding the skins, the Jets are in fine form approaching their 30th anniversary in 2019. Boom Crash Opera’s current line-up of Andrew De Silva (vocals), Peter “Bungie” Farnan (guitar/vocals), Peter “Maz” Maslen (drums/vocals) & John Favaro (bass) (keyboards/guitar) continues to reinforce their legendary live reputation from their early roots in the late 1980’s to present day. 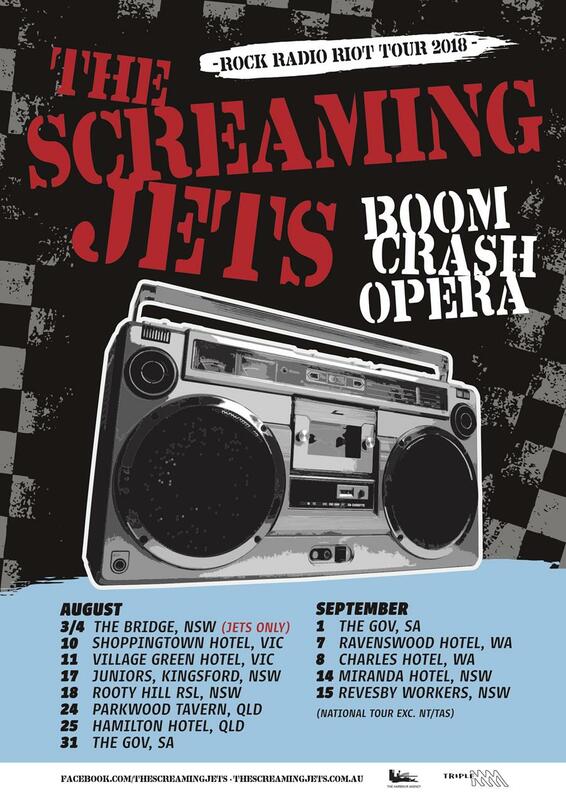 The ROCK RADIO RIOT tour will be the only chance to see The Screaming Jets and Boom Crash Opera sharing the stage in the great pub rock venues of Australia. They will be playing all their greatest hits from the late 1980’s and early 1990’s as well as new material and some other Aussie classic rock staples revitalized by the Jets. 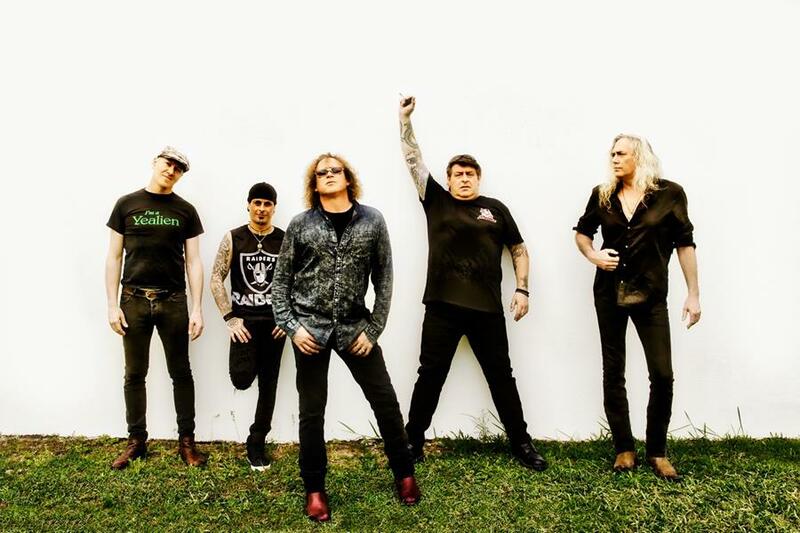 To warm up for their national tour, The Screaming Jets will take to the stage on Friday August 3 and Saturday August 4 at The Bridge, Rozelle NSW. These shows will see the band perform songs from their forthcoming album ‘Gotcha Covered, The Great Australian Songbook’. The album is a list of the band’s favourite Australian rock anthems covering songs from the 70’s, 80’s and 90’s. Triple M listeners were given the opportunity to choose the tracklisting to the album, which will be available in June.